Firefox is not a slow browser. While your experience may differ, I think that Firefox is loading the majority of web pages and sites as fast as Google Chrome. At the very least, it is hard to tell a difference. While you can speed up browsing in Google Chrome, the options that you have are fairly limited when compared to those of the Firefox web browser. 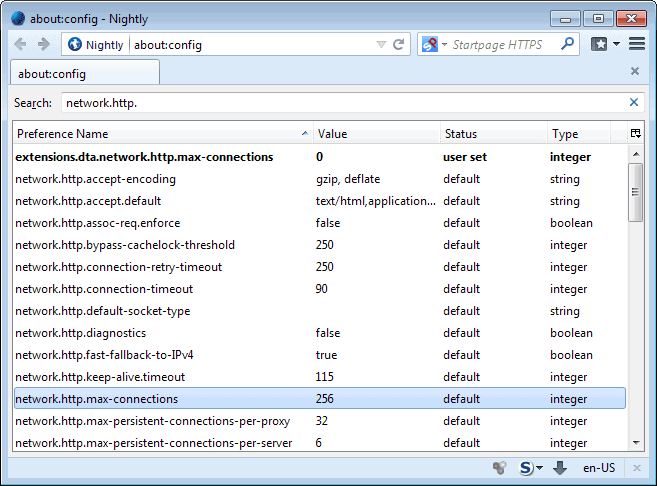 You can configure Firefox so that websites get loaded faster in the browser. I'm not talking about improvements that you only see listed in benchmarks, but real-world improvements that you notice when you load sites in the web browser. There are however tweaks that have no effect, or even a negative effect on Firefox's page loading performance. This article is about those. One of the main issues that you will notice when you search for ways to speed up Firefox on search engines such as Google, Bing or Startpage is that most guides are outdated. How you know that? By noticing that they refer to preferences that are no longer used or use changed values. Many guides suggested to enable pipelining and related preferences. They may suggest to enable pipelining for normal and proxy connections, or increase the maximum number of requests from 4 to 8. Research has shown that pipeling has no effect on the page loading time of the browser, at least not in its current form. According to the researcher, the main reasons for this is that most websites load contents from different domains making pipeling less effective as it could be, and that bottlenecks on the page limit its effectiveness as well. So, if you enable pipelining in Firefox in hope of seeing huge speed gains, you will be disappointed as there won't be any. To make matters worse, the suggestion to modify the network.http.pipelining.maxrequests parameter to 8 won't do any good as well, as it is set to 32 in newer versions of Firefox. Then there are sites that suggest to increase the value of the network.http.max-connections parameter to 64. While that may have worked years ago, it won't work anymore as the new default value of the parameter is 256. Next we have network.http.max-connections-per-server which many guides mention. The preference has been removed from Firefox making network.http.max-persistent-connections-per-server the relevant preference in Firefox. So, disabling the hard drive cache and moving the cache to memory should speed browsing up since memory is faster than disk, right? Not necessarily. First of all, Firefox is already using both caches by default, which means that some cached items are already in memory so that they are loaded from there when needed. Even if you disable the disk cache, it will be used. One plain and simple example of this is when Firefox's memory cache is full. There are negatives to going memory cache only in Firefox. Since some items are not cached on disk, they are not persistent. This may increase the page loading time of websites in Firefox after restarts. I'm not saying it does not speed up things in Firefox, but only if the parameters are right. If you visit a site several times in a single browsing session, you may notice a speed improvement doing so. More if the Firefox is stored on a slow disk, less to none if it is stored on a fast drive like a Solid State Drive for example. When you minimize Firefox, RAM is swapped out which means that it is reduced and available for other programs and processes on the system. What is meant by that is that the data is saved to disk for the time being, which can result in a delay when Firefox is restored. Mozilla discovered back in 2008 that the minimize - swap feature does not really do anything. The main problem in Windows is that the Task Manager is lying in its interface, and that the minimize action in most applications has a visible effect. But it doesn't really do anything - it only says that the application is now a candidate for being swapped out (that was useful in the Windows 95 days). But when an application touches the memory again, then that part of memory will be marked as active again, and the memory usage seems to grow again (but that's an illusion). Applications that do a lot of stuff in the background will seem to jump right back again, but in reality nothing really changed (look at your hard disk light - it didn't even blink !). The authors who wrote the guides back in 200x are not really to blame here, as things were different back then. The main issue here is that today's authors are picking up those guides again. Search engines are partially to blame for that, as they keep old guides at the top of the search results even though that should not be the case, as they are of little use nowadays. Today's authors who copy those preferences without doing research on the other hand are mostly to blame for that. It is easy enough to write an article about speeding up Firefox using those old guides and the suggestions that were posted in them. I think the biggest speed problem in Firefox is that when you search an alphanumeric string that’s fewer than 16 characters from the urlbar, it just sort of sits there for 3 seconds having a think before executing the search. Maroon, I’ve been bothered by that 3 second pause for quite a while. Urlbar Search Fix definitely works. Nicely done! Disabling disk cache is useful in some scenarios. For example, I disable it, because I have 64GB SSD (so I want to minimize disk writes), 16GB RAM (and I use 1GB memory cache), 30Mb/s Internet & Firefox runs all day without closing. I usually hit 1.2-1.5GB memory usage, but it’s not a problem for me. And about some other tweaks, can you investigate if “network.http.keep-alive.timeout” (I change to 600) & “network.http.max-persistent-connections-per-server” (I keep at default) have any impact? I lost the count of so many “tweaks” I tried on Firefox and on Windows, after some time I stopped because I barely notice any improvement. Today I only make use of privacy related tweaks for my browser. As for Windows I only uninstall programs using Revo Utilities to avoid registry “garbage”, and the good old Disk Defrag to tidy up my hard disk. “Even if you disable the disk cache, it will be used. ” to quote this line of the article. and never ever experienced disk cache used. Even with very long streaming videos, very heavy downloads. Disk cache folder verified, and empty to the byte. When the memory cache is full (64MB here) it simply compels to the rule FIFO. Moreover, after having tested different combinations, in my experience having my Firefox/Pale Moon profile on RAM disk combined to disk cache disabled brings me the best, fastest rendering. That means that when the cache is filled, it will discard data, not start using the disk. I think I understand where the ambiguity about disk cache relies. I was thinking about this issue because I knew there was this ambiguity, I remembered having encountered it at one time. – The speed and reliability of your internet connection. – Your network specification and settings (if you’re on a network). – How well maintained and clutter free your PC or laptop is. The browser you use, provided it’s the latest version, makes very little difference in the end. That’s the one good thing about reading browser comparisons done by websites like Tom’s Hardware. They may not be great, but at least it levels the playing field in terms of testing them on the same internet connection, network and machine. I’ve lost count of the number of times I’ve seen someone from Germany saying there experience of Firefox is great whilst someone from New York says it’s terrible. Are **ALL** your settings, on every variable, exactly the same? OF COURSE NOT! Therefore it’s not a fair comparison! I agree some of the old tips do not work in the latest Firefox. Some tips did not even work at the time the tip was created. However, changing the ‘max connections’ can speed up page loading for some people. However, if the wrong figure is used, it can slow things down. At 16 max connections, for me, ALL the pictures loaded in 13333 ms. However, if I leave it at the default of 256, only about half load. The problem with tips is the everybody’s computer or internet connection is different. One set of figures for one person does not always work for another person. ’16 max connections’ may not work for you. However, try the test site. Strange. Looks more like a bug in Firefox if you ask me but interesting nevertheless. I tried your link, and kept clicking ‘reload’ just to see what would happen. I expected it to get faster, but it didn’t always do that. The speed varied with every click, up and down. That’s without resetting max connections at all. I’m on FF 26. It seems what works for one person doesn’t even work the same way all the time. my post may be late but at least I tried this method. My connection recommends 24. it gave a boost to reload pages and speed up my browsing. thank you for this tip. All I know is the more add-ons I have, the slower it takes to load. Remove add-ons and it speeds up a whole lot. Add-ons like ad blockers slow down Firefox because they scan a page prior to opening, close down ads before a page is open. I currently run with 20+ add-ons in Firefox and even using the Faster Fox add-on page loading is still slow regardless of what it claims it can do. If you want a faster Firefox, simple run without any add-ons. In Chrome I run with 20+ extensions and it loads about the same as Firefox with its 20+ add-ons. I find machine specs have little to do with performance of either. I’m on a 25 Megabyte service and not 25 Megabit as some has already mentioned they run a 30M service. If they are using sites like Speedtest.net to find results of their service speed. Know this the default setting of that site in my experience is megabits. If you change the settings to register megabytes instead you’ll see a BIG disappointment in service for some providers who claim to give megabyte service when they actually mean megabit. At first visit and at the default settings I registered over 100M on my 25 megabyte service and I knew that couldn’t be possible so I checked the settings and sure enough, when I changed the settings from megabit to megabyte. My 25 megabyte service is only registering 10 megabytes and according to my service provider I am lucky. Most everyone else is only registering 5 megabytes. When you’ve done everything you can to make your speed faster, ultimately it comes down to hardware. My service is a cable service. My building is more than 60 years old. The wiring is ancient and the cable in the walls hasn’t changed since they added it in the 70’s. My mum lives in a newer building (less than 5 years old) and her 25 megabyte service registers at 18 megabytes she runs a Windows 7-64b machine on an AMD Athlon IIx4 3.0Ghz with 8G RAM. I run Windows 7-64b on an AMD FX Hexcore 4.1Ghz with 16G RAM. She has a slower machine but a faster speed than I do in terms service. Her Firefox loads faster than mine but only because I gave her the basics when it comes to add-ons…(Adblocker Plus + pop-up + elements blocker, Ghostery, and Greasemonkey for some site specific scripts). Whereas I run a lot more add-ons specific for my needs. I’m using memory cache only for years now. Withe maximium size of “232500”, anything above breaks the functionality. And I never saw it getting filled. Anyway a I never saw it get full. Plus at least I know that I don’t get any older stuff than startup. I disliked getting old stuff because of disk cache. Looking forward to the post that lists all the tweaks that DO make a difference .. I too find that tweeks don’t do much. I keep the addons down to a minamum, right now I have eight. Add blocker, flash blocker, snd a few productivity addons.